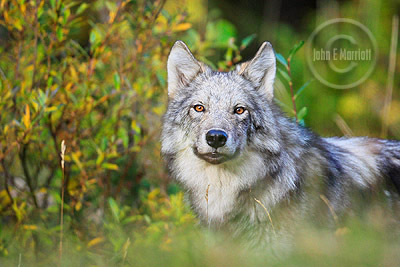 As fall slowly approaches here in Banff National Park, I thought now would be a great time to take a look ahead at autumn / fall wildlife photography opportunities for Banff and Jasper National Parks and beyond. I’ll begin with Banff, which offers not only some great fall landscape photography, but some fantastic wildlife photo locations, too. Suprisingly enough, one of the premier wildlife viewing locations in Banff National Park each fall is around the Banff Springs Golf Course. The best elk rut in Banff occurs on the hallowed Springs fairways and patient photographers will find lots of great opportunities for photographing big bulls and their harems of cow elk both on and off the course. 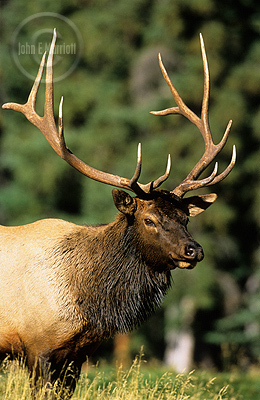 Another great area to find big bull elk each September and October is on the Lake Minnewanka Road, where lucky photographers may find not only elk, but also bighorn sheep, coyotes, and mule deer. The Bow Valley Parkway is also an excellent place to spend some time in Banff National Park viewing and photographing wildlife. Banff Travel offers Evening Wildlife Safaris along the Parkway, or you can simply drive along yourself and get lucky with bighorn sheep, coyotes, bears, and even wild wolves. 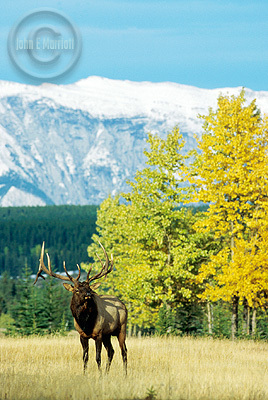 But most wildlife photographers in the park are going to focus their attention on the incredible elk rut. This is by far the best time of year to view and photograph the giant bulls, and again, you’ll want to concentrate your efforts on the Golf Course road at the Banff Springs Hotel, or on the Lake Minnewanka Road. Let me know if you have any questions before your big trip, and happy shooting!